Karaktervol huis in een middeleeuws dorp met voorzieningen, in een landelijke omgeving. Ons eigendom is door TripAdvisor uitgeroepen tot "Certificate of Excellence 2018". Prachtige boerderij in een middeleeuws dorp. Sympathiek gerestaureerd met behoud van het karakter van de woning, waaronder een prachtige originele eiken trap en granieten open haard met houtkachel. 3 ruime slaapkamers, 1 met complete badkamer inclusief bad en inloop kleedkamer. 2e badkamer heeft een douche en toilet. Comfortabele zit / eetkamer en aparte keuken. Eigen tuin met barbecue. 5 minuten rijden - Er is een groot openbaar openluchtzwembad met glijbaan. Overdekt zwembad en jacuzzi, sauna. Ligstoelen en speeltuin voor de kinderen. Er is een restitueerbare borg van £ 200 te betalen wanneer het volledige saldo van de vakantie verschuldigd is. Dit bedrag wordt na inspectie van de accommodatie en binnen 2 weken na uw vertrek gerestitueerd. A typically French holiday house converted from an old property 10+ years ago; not modern but charming with plenty of space. All perfectly comfortable with everything working. We were at the house for 10 days (Family of 2 adults / 2 late teenagers) and were very happy. We had good weather most of the time which always helps and found plenty to do locally / within 45 mins drive. Good points: All bedrooms comfortable. Kitchen well equipped. Lots of hot water. Good built-in BBQ. Only 2 mins walk from village tabac, bakery, post office. Garden is sunny from mid-day onwards. Wi-Fi good. English TV. Lynn (the owner) was there to greet us and was very friendly. Less good points, although none spoilt our holiday: Main bedroom close to the road and can hear passing infrequent traffic in the morning. All of the garden / seating area can be seen by passers-by but these are few and far between. 2nd bathroom shower cubicle is tiny so we didn’t use this. Parking is outside the house half on / half off the road. All in all Rose House was a very good find for our holiday, we had a great time. Thanks for your comments I am so glad you enjoyed your stay, and it was lovely to meet you all. Regarding the parking, smaller cars do fit on the pavement on this quiet road, however on the map that I sent you it shows that there is an alternative parking spot in my garden across the road. I am really sorry if I did not mention this to you. The house radiates a great peace and history. You come back to the roots of being human. We enjoyed every hour and the hectic pace of everyday life fell off by itself. On arrival we would have wished for a dishwasher, but at the end of our holiday it was just that which brought us to rest... no useless electrical appliances. So dear guests, let yourself in to this place of soul salvation and recover as we have done. We can highly recommend the house. We spent two very nice weeks with our two kids in Brigueil. The house is beautiful and well equipped. We loved our breakfasts and dinners in the little garden, especially when the horses and donkeys from the adjacent pasture came to look after us. It is a perfect place to unwind. There is a bakery and a butcher in the village. Unfortunately, the little village shop closed this year, so we had to go to St. Junien for shopping, which was not a problem. There is a soccer pitch and a tennis court nearby, both of which we used frequently. We also rented some bikes in Limoges for 5 Euros each per week, which was an excellent deal. Lynn was very helpful and responded immediately when we had a question. We really enjoyed our week staying at Rose House. The house has so much character and has retained lots of its original features - especially the original staircase. There was plenty of space and it was an added bonus to have 2 bathrooms. The kitchen was very well equipped with everything you could possibly need. We enjoyed sitting in the lovely garden area. Lynn was very welcoming and went out of her way to provide us with information on activities and things to do in the local area which was really helpful. There is a boulangerie, small supermarket and tabac within walking distance but St Junien a 15 minute drive away has a great choice of restaurants, shops, supermarkets and a market on Saturdays. It also has a good indoor/outdoor swimming pool complex (with slides and diving boards) which the kids really liked. There's plenty more to do and see in the area. There are quite a few swimming lakes with pedalos and kayaks to hire and it's also possible to hire canoes at various places along the river Vienne. There's also lots of places of historical interest including Oradour Sur Glane, Montrol Senard (a village which shows you what it would have been like living in rural France over 100 year ago) and Rochechouart, to name a few. All in all, we had a fabulous week in a very comfortable house and would definitely recommend Rose House as a great place to stay. 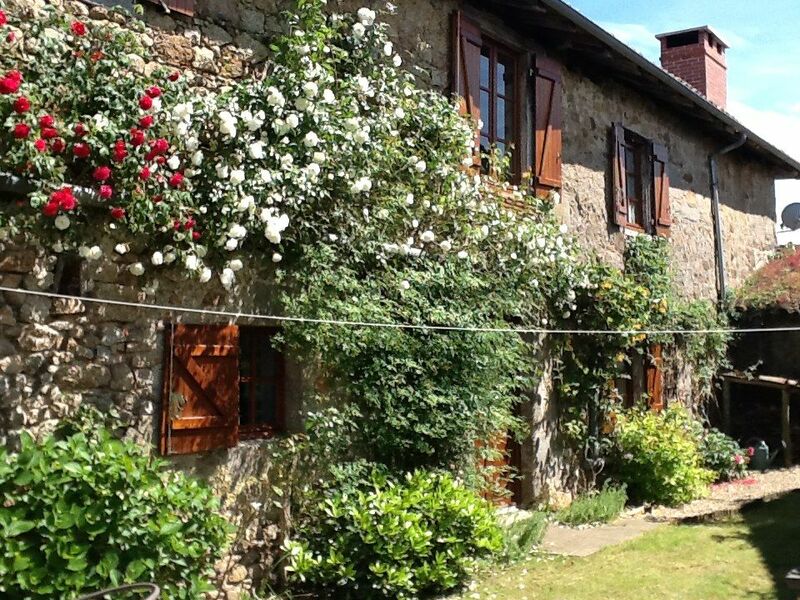 We've just returned from a two week stay at Maison des Roses in Brigueuil. The house leant itself to our style of holiday. Lazy days relaxing in the garden, eating outside on the terrace, walking into the village in the mornings to buy croissants and pain from the execellent artisan bakery, having a drink in the evenings at the typical and very friendly bar in the village, buying excellent meats from the butcher, getting some of our food from the small but well stocked mini market run by a very friendly French couple. The house was very comfortable, and renovated to keep lots of the original features- stone floors, a wonderful oak staircase, old wide floorboards upstairs. The large sitting/ dining room was good to retreat indoors if the heat was too much. Our two border terriers were able to lie in the sun or shade, or retreat indoors when the heat got too much! There was far more to do and see locally that we had anticipated, this being our first visit to this area of France. Lots of small sleepy villages to explore, a very good restaurant in the nearby village of Lesterps, fascinating and very well preserved Roman baths at Chabanais, Limoges itself we only briefly touched on but the cathedral with its attached botanic garden and art museum was somewhere we will definitely revisit. The markets didn't disappoint either. St Junien, ten minutes or so away had a wonderful indoor and outdoor market we visited both the days that it ran. I would recommend both this house and this area if you are interested in typical, real rural France. The people were extremely friendly and engaging, especially as we had the two dogs! A great ice breaker!! I fell in love with this beautiful house just looking at the photos and videos and when we arrived at the property I wasn't disappointed, it was even better in the flesh 😄😍 Hubby and I were here with our daughter, her hubby and our 2 granddaughters, 3 year old and 6 month old. Everything we needed was provided and a special thank you to Lynn who actually went out and bought a travel cot for our use which saved us having to take ours over on the plane! It is a beautiful house and you can see the love and hard work that has been put into restoring it to the 17th century look and feel that it has. There are photographs of the place when they first bought it and you just can't believe how they knew where to start but believe me, you will fall in love. Lynn also provides a 'pink folder' and in this she has put information about the area and informs visitors of places to visit, restaurants, lakes....the list goes on. Customer service.....can't beat it, Lynn was the perfect host without even having to be at the property she has everything covered. We had some lovely meals out and around the area, just a shame the restaurant in Brigueil has now closed down, think our favourite was Le beouf Rouge (please forgive me if I've spelt that wrong lol) in St Junien, we know very little French but managed to muddle through with help from the waiter who spoke a little English. If like us you're not fluent in French take a dictionary. We also visited the village of Oradour Sur Glan, a museum and village ruins which shows the atrocities that happened in World War 2, very poignant and we happened to visit on day it happened 72 years ago. There are videos playing and some are quite graphic so be aware of them if taking young children, our 3 year old was too young to understand what they were showing and she didn't stay around long to watch! Thank you so much for such an in-depth review, I am sure other future guests will find it useful. It's always good to receive the appreciation for all the hard work we have put into this beautiful property. Look forward to welcoming you back. Brigueuil is een mooi vriendelijk dorp, daterend uit de 10e eeuw, waar vestingmuren nog steeds op hun plaats zijn en je ziet mooie voorbeelden van de middeleeuwse architectuur. De boerderij ligt op slechts een paar minuten lopen van het centrum van het dorp met een Tabac, een apotheek, een kapper, een bibliotheek, een slager, een bakker en een garage. Er zijn restaurants binnen 4 kilometer van het dorp. 7 minuten rijden brengt je naar de oude marktstad St. Junien aan de rivier de Vienne, waar u een vrijetijdscentrum kunt vinden met binnen- en buitenzwembaden, glijbanen, speelruimtes en ligstoelen, professionele 18 holes golfbaan, supermarkten, treinstation, ziekenhuis, cafés, bars, restaurants, banken. Er is een leuke, schilderachtige markt op zaterdagochtend. Etagnac is een klein dorp en slechts 12 minuten rijden met zoveel te bieden: het kasteel van Rochebrune open voor het publiek met zijn spiegel-achtige gracht, meer voor de enthousiaste vissers, dorp bar / restaurant en hotel. Mooie Confolens stad ligt op 15 minuten rijden, opnieuw aan de rivier de Vienne met een prachtig uitzicht. U kunt een waterfiets / kajak / paddle-planken huren om het landschap in u op te nemen. Net verder langs de rivier zijn er 3 openluchtzwembaden met glijbanen en picknicktafels voor uw lunch. Het heeft geplaveide straten en fantastische architectuur. In augustus organiseert Confolens een week lang het World Dance Festival en is zeker een bezoek waard omdat het meer dan 300.000 mensen trekt. Aan de rand van deze stad ligt een dierenpark op 11 hectare. Op 15 minuten rijden ligt Oradour sur Glane, een dorp dat werd verwoest op 10 juni 1944, tijdens de Tweede Wereldoorlog, door de Duitsers S. S. Het is ruïnes bewaard gebleven om te laten zien dat het slachtoffer was van een gemene misdaad die 642 onschuldige burgers heeft gedood. Rochechouart - Een mooi stadje op 20 minuten rijden met zijn prachtige kasteel, dat een museum voor hedendaagse kunst heeft en een goede plek is om de Route van Richard Leeuwenhart te beginnen. Het heeft ook een klein museum over het meteorietfenomeen. Er zijn bars en restaurants om uw tijd door te brengen in dit ontspannende stadje. FIETSVERHUUR: Fietsen kunnen worden gehuurd van een bedrijf dat zakt en naar het huis gaat, vraag de eigenaar om een ​​folder. PAINTBALL: Bussiere Galant - Paintballcentrum ligt op 37 km van het huisje. Exideuil - 20 minuten rijden - Er zijn twee gangen die duren van 2.30 - 3 uur of 6 uur. Confolens - 15 minuten rijden - Er zijn 4 gangen die duren van 30 minuten - 5 uur. Saint-Victurnien - 10 minuten rijden van de Cottage.